I enjoyed reading a recent article in Sports Illustrated entitled “Let it Lei”, detailing the Hawaiian pre-season retreat that Russell Wilson arranged for the Seahawks. Read the article here. I’m from the Seattle area, so the Super Bowl loss to the Patriots is still painful for me. We were literally one yard away from a second Super Bowl victory, and— well you know what happened. 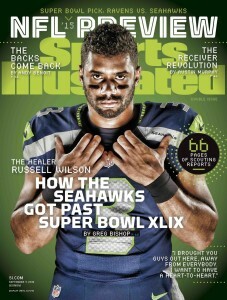 Russell Wilson, in his infinite wisdom, understood that a “come to Jesus” moment was necessary. There was clearly tension and a need for the players to get things “off their chest”. What Russell did was similar to what a CEO or senior executive might do at the end of a failed initiative. He heard from the team’s perspective, what went wrong. He gave them the freedom to say anything they wanted, even though some of the blame was aimed at him. He allowed them to blame each other and the people in “leadership” (i.e., Pete Carroll). For 45 minutes members of both offense and defense said whatever they needed to say. “Harsh words were exchanged and all grievances were aired.” Players were able to directly speak to accusations, and defend their actions. Team members were called out if they were perceived as not owning up. That is the magical part of peer-to-peer accountability. The team collectively focuses on what’s really important. What’s the goal? What’s our mission? How will we work together to achieve it? If your team has experienced a significant failure, think about how you might use the Seahawk’s model to increase peer accountability. *(I wouldn’t try this without a facilitator – at least not the first time). Get them to open up about everything – including who they feel is at fault. Create a space where they feel safe saying whatever is on their heart and mind. Most importantly, let them work it out, without you in the room. They have to do this work with each other. You will notice that Pete Carroll, and members of the coaching staff weren’t invited! Successful teams don’t rely on leaders to hold them accountable, they hold each other accountable. I’d love to hear your thoughts. Please share your comments. ‹ Amazon Culture – Are We Surprised?